Yaaay! I'm so excited to be able to capture your love!! It doesn't matter if you're one of my wedding couples or just getting your engagement photos done, I'm so excited to work with you and make these memories last forever. But NO worries!! I'm here to help you. I created this page especially for this special occasion and to help you are your mind and answer (hopefully) all your questions. If there is anything else I might have forgotten about PLEASE feel free to email me directly! I want you to feel as comfortable AND prepared as possible for your session!! 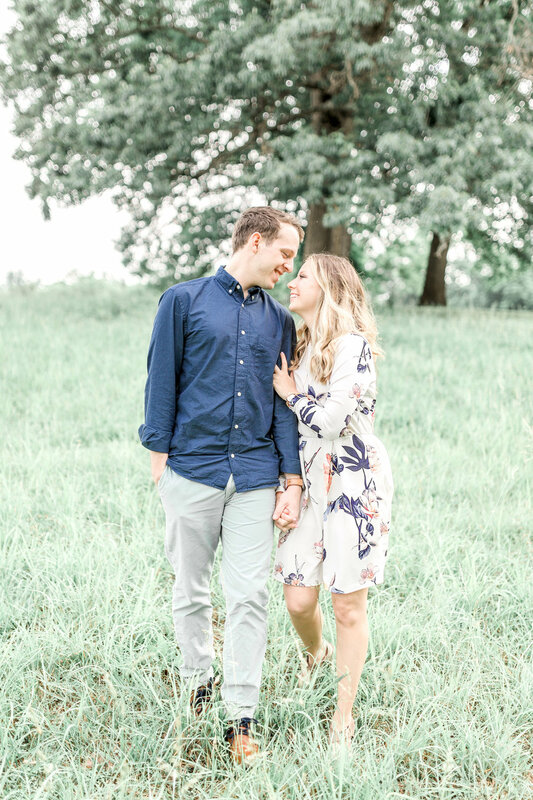 When is the best time to get your engagement photos done? The best time of the day is usually about 2 hours after sunrise or 2 hours before sunset. It will give you the golden light in the background and the skin tones look amazing. This time of the day will also avoid shadows in your faces and you will be able to have your eyes open. This goes for any season. If you're getting married in the fall you might want to schedule your engagement session during a different season to have a different variety of your photos. Also consider when you want to send your Save the Dates and if you'd like to use your engagement photos. How do we choose the perfect location? There are so many beautiful sceneries in Richmond and the surrounding areas to choose from. I definitely encourage you to choose a location that means something to you, maybe where he proposed or you had you're first date. I know it can be hard sometimes especially of your trying to achieve a certain look (for example loins for flower trees in the spring) or the place is further away. Please don't hesitate to mention it though, I am willing to travel!! :) Feel free to reach out and I'm more than happy to help you find the perfect location. Can we bring our pup(s)? YAAAAS!!! Please do. They are such a huge part of your life and definitely a part of YOU and YOUR PARTNER, your little family. We will get some photos with and some without them to cover everything. You're welcome to bring 2 outfits for your engagement session, one dressier and one more casual. I love when my couples try to coordinate their outfits. Don't be afraid to wear patterns like a floral dress (I LOVE FLORAL DRESSES), stripes or shapes. They will add details to your photos and make them look even prettier. I would look for bigger patterns though just because tiny patterns won't show up in the photos. It looks great if you mix up different types of patterns and solids. If one of you is wearing something more colorful, I would try to keep the other person more neutral. Pastel tones are beautiful in the golden light and make your skin look great. They also keep the light and airy feel in the images that you're looking for. But the most important thing is that you feel comfortable in the color you're wearing, the type of clothing you have on and that you feel flattered and beautiful. Long, flowy dresses will definitely add the romantic feel and I love photographing a dress that flows with your movement!! Accessorize!! YES PLEASE!! Add scarves, any size necklaces, earrings, belts... I can't wait to see what you're wearing. Those 'little' details add so much character to your photos. This is something I never even thought about. But after my now husband and I got out photos taken for the first time I knew I have to include this. You know your partner better than anyone else so you're the best person to prepare him. As you know, I enjoy capturing you in your movement and actions. If he is not aware of this, he might think you're getting some smiling at the camera photos done and showing off your ring. It might seem weird if I suddenly say something like "go forehead to forehead" or "nose to nose". Help him to understand why YOU love this style of photography and show him different poses you like. It will help loosen the tension from the beginning and he won't be so surprised or feels as uncomfortable. I totally understand that you're feeling nervous, especially if you have never gotten your photos done. DON'T worry! I do not expect you to be pros or models. I want to capture what makes you as a couple and your love for each other. Usually it takes about 15 minutes to break the ice and just relax. It will be fun, I PROMISE! Most of my brides enjoy this time to do a test run for their hair and make-up. I totally encourage this because it will show you how it will look in your wedding photos. Some only get their make-up done and save the hair for their wedding day, It's totally up to you and what you feel most comfortable with. This is really important! I schedule your session to have the perfect light and enough time so that we don't have to rush. I'm a natural light photographer and depend on that light outside to capture these beautiful images for you. I totally understand that sometimes things happen, just try to be on time because I don't want you to loose the golden light and shooting time. I hope all of these tips were helpful. Please don't hesitate to reach out if you have any other questions. I'm happy to help!! I cannot wait to capture your love!! !